Davidoff The Brilliant Game is very charismatic fragrance for the modern man. Davidoff The Brilliant Game 100ml. Eau De Toilette is very charismatic fragrance for the modern man who knows his goal and bravely behind it goes. Has been launched in 2014. The extraordinary intensity and freshness of this fragrance he can conquer any woman who smell it. Oriental essences and spellbinding gourmet notes of eau de toilette The Brilliant Game lets you enjoy every minute of the day to the fullest! 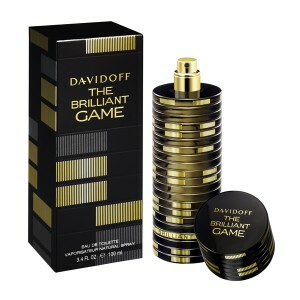 Beginning fragrance Davidoff The Game Brilliant first opens with refreshing flavors of red currant and sparkling lemon. Orange chords have a slightly bitter flavor and essence of sage captivating blend of masculine vermouth. Heart fragrance is composed of magic orange blossoms and the warm tones of cedar. The basis of smell permeates coumarin, hay and intoxicating tonka bean. Delicate finishing touch creates gourmet caramel. With this exceptional scent will make you feel attractive every day! Men's Eau de Toilette Davidoff The Brilliant Game is hidden in the original bottle, which symbolizes the dynamism of this fragrance. The bottle perfectly in the hand and allows quick use. The men's fragrance Davidoff The Game Brilliant also effortlessly attract the attention of women! The game begins! Enjoy it! Davidoff The Brilliant Game - is not just a men's fragrance. This is - the essence of the emotional, rich passions and hopes of the phenomena in the world - the casino. Where decide the fate of the players, the atmosphere is heating up to the limit, revealing the true nature of man. Carry with you all this subtle game of the soul - that is, calling this product. If you were the center of attention, he always emphasize your individuality and uniqueness. Do not lose your head, because the disclosed fragrance begins with this storm bracing components, such as the American cocktail, ripe red berries and refreshing citrus inclusions. The same list includes sage and invigorating bitter artemisia. Now, before you quiet prudent player, the epitome of taste and tranquility - a delicate orange blossom and cedar Noble played a role. Train will leave behind a lot of noise about the extraordinary originality of the owner, because here it is fascinating surrounding its delightful chords tonka bean, vanilla caramel sweet, fragrant smell of hay and coumarin burning spices.